So yes, I am cheating by talking about my most current book, but this is my blog so I do what I want. Bam! Anyway, the last book in the Jinn Trilogy released last week. Woohoo!! Olivia and Holden always beat the odds. Destined to be apart, there was nothing they wanted or fought for more than simply to be together. But no matter how great their love, the hurt they've caused each other may be more than they can bear. An evil like no other has risen from the underworld, leaving nothing but death in its wake as it seeks out the one thing it requires: complete and utter submission from the jinn. Losing the angel has left Olivia weakened beyond repair and unable to help even herself. Frustrated with her loss of power and devastated by her part in the death of two cherished loved ones, she struggles to find the hope she once relied on even though her relationship with Holden is crumbling. An offer to help comes from an unexpected source, but it isn’t without cost. To save herself, she will have to give up everyone else. Holden’s powers are stronger than ever before, but his control slips further and further from his grasp, putting everyone around him at risk. Unable to forgive himself or Olivia for the death of a friend, he focuses on the only thing that matters: insuring the freedom of the jinn. But as his past comes back to haunt him, he is pushed further and further into the darkness. In their final battle between good and evil, no one is safe and everything will change. - "Finished vestige, loved it. Was a little concerned when I read your teaser but well done, well played. Not to many tears shed." - "I LOVED the ending of Vestige." - "Thank you thank you thank you it was everything your readers could ask for! Loved it so so much!" - "Finally finished Vestige... ... That about sums it up. Thanks for another great ride"
- "Damn. That was fantastic!! 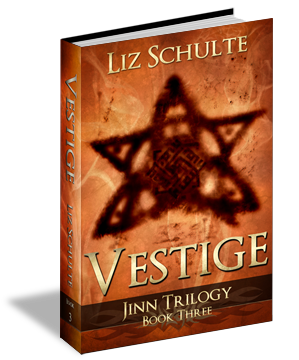 This is why I stalk Liz"
- "Just finished Vestige and wow! I went through every emotion possible.Absolutely amazing bòok!" So there you have. This book may or may not make you cry, it will make you want to stalk me, and it's a solid ending. Okay, that's enough shameless self-promotion until the next release!